Sri City, May 24, 2018 :- Mr. Kojiro Uchiyama, Consul General of Japan in Chennai visited Sri City on Thursday. Mr. Ramesh Subramaniam, President, Sri City Foundation extended a warm welcome and briefed him on the salient features of the mega industrial park, and the investment opportunities, and highlighted the specific advantages of doing business in Sri City. Mr. Kojiro Uchiyama took over as Consul General in the second week of April. The purpose of the visit was to witness the existing infrastructure at the mega industrial park and gain first hand knowledge of its business potential and the progress achieved. 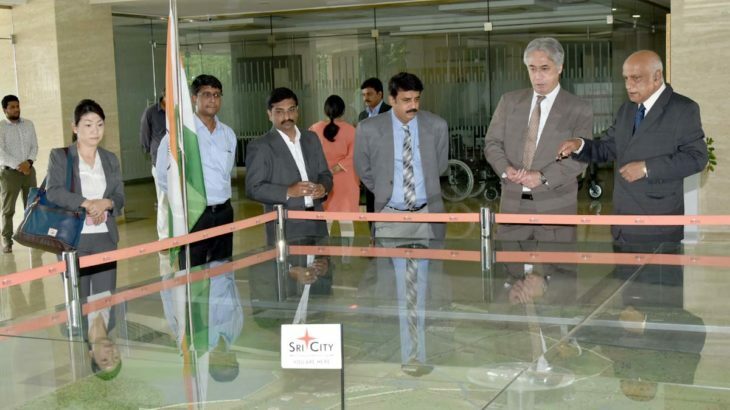 During the briefing session, he evinced keen interest and inquired on different aspects of Sri City. The CEOs of all the Sri City based Japanese industries had an interactive meeting with Mr. Kojiro Uchiyama and gave a positive feedback on the business friendly attitude of Government of AP and Sri City. Following the briefing session, they went around the campus and visited the production units of Isuzu and Kobelco. Ms. Shiho Bamba, Counsel, Consulate General of Japan was also present.